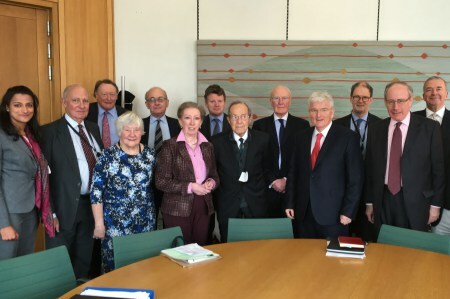 The Top Level Group (TLG) of UK Parliamentarians for Multilateral Nuclear Disarmament and Non-Proliferation is a cross-party group of senior British parliamentarians who share the belief that multilateral nuclear disarmament, non-proliferation and nuclear security are critical global issues ought to be addressed, as a priority, by governments worldwide. The group was established in October 2009, in response to, and in tandem with, the growing international prominence of the issue of nuclear disarmament and non-proliferation. This momentum has been driven by former US Secretaries of State Henry Kissinger and George Shultz, former Defence Secretary William Perry and former Senator Sam Nunn in their Wall Street Journal article of January 2007, (which has since evolved into the Nuclear Security Project), as well as by U.S. President Barack Obama’s Prague speech in April 2009. The members share the view of the need to work towards a world free from nuclear weapons. However, they believe that this is only achievable through multilateral and incremental steps which also maintain national and international security. The individual members of this group are experienced, high profile and highly influential in the political arena. In pooling the talents of these individuals, the TLG utilizes their combined skills, knowledge and experience to provide further political impetus for constructive and concrete policy outcomes in the UK, Europe and the US. The Top Level Group encourages better quality of public discourse and understanding on these issues by participating in public and private events; meeting with politicians, military figures and diplomats as well as key policy decision-makers from the UK, continental Europe, Russia and the US; and also coordinating activities with their counterparts across Europe, through the European Leadership Network. Advocate the agreement of a Fissile Material Cut Off Treaty (FMCT).